Dr. Goldenberg considers Clear + Brilliant to be a great solution for patients looking to clear the skin of hyperpigmentation, melasma, freckles, and age spots, as well as reduce pore size, help with acne, and improve the general appearance of skin. The laser system offers unique advantages as a means to reverse the signs of aging and is a completely safe way of rejuvenating facial skin. Clear + Brilliant is less invasive than other treatments, meaning less down time. Some call this procedure a lunch-time laser – you can have it done and go on with the rest of your day. 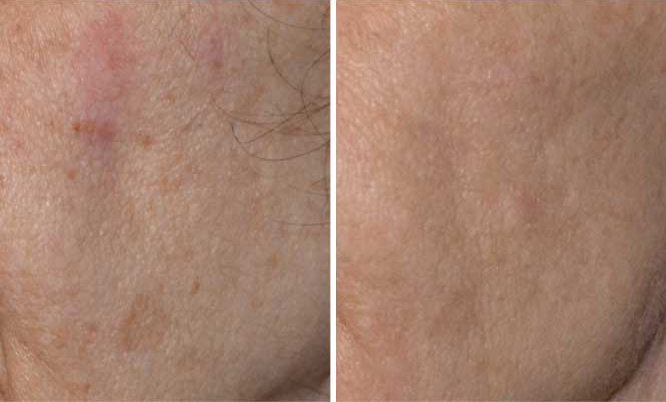 The treatment is non-surgical and Dr. Goldenberg has used it to successfully refresh the look of many patients in NYC. Dr. Goldenberg knows that when your skin is looking at your best, you feel most confident and can present to the world the most positive image of yourself. Unfortunately, the sun’s rays can be detrimental to the skin. Prolonged exposure over time can take a toll on a person’s appearance, causing lines and wrinkling that can make you look older than you are. Dr. Goldenberg uses Clear + Brilliant to target skin damage that has resulted from both the sun and from the body’s natural aging process. Clear + Brilliant is also the only laser approved by the FDA to reduce pore size. Pore size is genetically determined, and many topical treatments claim to help, but do little. Clear + Brilliant is a safe way to reduce and maintain your pore size, so that you can look your best. Clear + Brilliant produces visible results with minimal risk. The treatment will refresh and balance your skin, so that you no longer have to hide behind concealers or rely on other makeup products to look your best. And, incorporating Clear + Brilliant into your routine is simple. Together with Dr. Goldenberg, you can plan your visits at scheduled intervals so as to maintain your fresh, clear skin with minimal effort. Because the treatment is quick and easy, there is not much prep associated with Clear + Brilliant. Your procedure can be complete during a lunch break from work, and is done within about 15 minutes. During treatment, you may feel a tingling, warm sensation from the interaction between the laser and your skin. As with any procedure he performs, Dr. Goldenberg is sure to be sensitive to your reaction so you can be completely at ease under his care. A topical cream will be applied to your face for anesthesia just before your Clear + Brilliant treatment. Dr. Goldenberg will then place the device at appropriate areas of your skin, customizing your procedure to your needs. The laser technology behind Clear + Brilliant is gentle and pain and discomfort are minimal during the procedure. There is little to no actual downtime involved. You will not have to take time off your busy schedule to recover, or have to stay out of public while your face heals. It is normal to feel a warm sensation for a few hours after your visit with Dr. Goldenberg, as your skin is still reacting to your laser treatment. Redness may also occur, but should subside in about a day. You will start to notice a glow within the initial week after treatment, after which time you can start reaping the benefits of your vibrant, re-energized face. Dr. Goldenberg has the experience that is essential when looking for the right doctor to perform your Clear + Brilliant procedure. He specializes in medical, cosmetic, and surgical dermatological. Dr. Goldenberg is dedicated to making the experience most enjoyable for each patient he treats, and he takes pride in the strong communication he fosters with his patients. You will be fully informed along every step of the way, so that you are always on the same page. Schedule your consultation appointment today to see if Dr. Goldenberg can help restore in you a more youthful look and to further familiarize yourself with Clear + Brilliant.